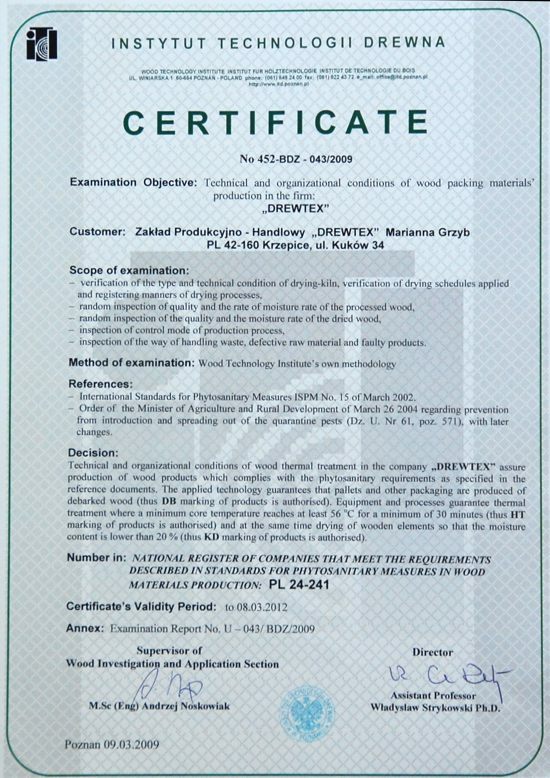 Our products are certified with EPAL Certificate and the certificate of Wood Technology Institute. OUR WORKSHOP IS ADAPTED FOR MANUFACTURING ANY KIND OF PALLET OR ANY UNTYPICAL, CUSTOM-MADE WOODEN PACKAGES. WE HAVE THE TRANSPORT DEPOT AT OUR DISPOSAL SO WE CAN DELIVER OUR GOODS TO OUR CLIENT’S COMPANY WITHIN THE EUROPEAN TERRITORY.